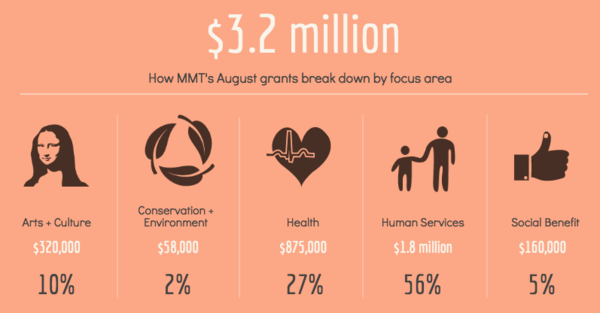 At its August program meeting, Meyer Memorial Trust awarded 17 grants and two program-related investments (PRIs), totaling just over $3.2 million for organizations working across Oregon. Eleven grants and a PRI, totaling $1.8 million, and representing 58 percent of all MMT funding awarded in August, fall under the category of human services: Those include a grant of $138,000 for the Diversifying Voices program, which supports new leaders focused on housing policy in Oregon, and a $252,00 three-year grant to support capacity building at Latino Network. One award, totaling $58,000, focuses on conservation and the environment: the grant will help build organizational capacity at the North Coast Land Conservancy. Two grants and a PRI, amounting to $875,000, are health-related. A $250,000 grant and a $500,000 program related investment support Cascadia Behavioral Healthcare’s work at the Garlington Center in Northeast Portland. Two arts and culture grants, equal to 10 percent of the August awards, total $320,000. One of the grants, for $200,000, celebrates Wisdom of the Elders, a two-decade old Native cultural organization that works in Clackamas, Lincoln, Marion, Multnomah, Polk, Washington and Yamhill counties. Two grants, totaling $160,000, for 5 percent of this award batch, focus on social benefit, including one that supports core training at culturally specific grassroots organizations across Oregon. How the grants and loans break down by county and focus area.